It is my belief that the major hurdle to growth in the small satellite market is the availability of cost-effective launch. The converted ICBMs of the former Soviet states have certainly helped the manufacturers located in countries where national policy allows their use. However, there are major users of Space, such as the USA, where the manufacturers find it difficult or impossible to use these launchers and this, in turn, has held back the development of the small satellite market. There are now several initiatives underway to address the launch problem. The initiatives can broadly be split into two types. Firstly, new launch vehicles are being developed: good examples being the SpaceX Falcon and the Virgin LauncherOne. What distinguishes these vehicles from most of those developed in the past is the fact that they are being developed by commercial organizations with an entrepreneurial culture and devoid of the politics and subsequent inefficiencies that plague government-inspired programmes. The second type of initiative can broadly be described as ride-share, whereby launch for very small satellites, commonly described as Cubesats, will be provided by some of the governments with large launch vehicles. For example, the U.S. Atlas-5 and the European Vega will be able to offer very low cost launch, typically to educational Cubesat developers. For small satellites, what we expect to see in the coming decade is, therefore, a split in the market into minisatellites aimed at operational missions for governments and commercial operators on the one hand, and much smaller micro/nanosatellites aimed at educational missions on the other. As the market leader for development of new small satellite missions, it is illustrative to look at SSTLs product development over the last decade and into the near future as barometer on whats happening in a general sense. For many years, SSTLs core products have been optical imaging satellites. At the start of this decade, SSTL started developing the disaster monitoring constellation (DMC) satellites, which were 90 kg satellites with wide swath multispectral imagers with 32 metre ground sample distance. At the time of their launch, in 2002/2003, these satellites were the most sophisticated SSTL had built. Over the course of this decade, the capability of SSTLs satellites has improved at such a dramatic rate that all of SSTLs current offerings are of higher performance than the first generation DMC. The principal reason that the performance of small satellites is improving at such a phenomenally fast rate is their use of terrestrial electronics. Terrestrial electronics tend to double their performance at unit cost every two years ­ a phenomenon known as Moores Law following Gordon Moores observations made in the 1960s that the number of transistors on a chip doubles about every two years. Through use of such electronics, small satellite performance is improving at a rate approximating to that of Moores Law. The improvements are dramatic ­ since the start of this decade, we have experienced an order of magnitude improvement in computing power, data storage, and data downlink speeds on small satellites and we now have small Earth observation satellites with bus performance surpassing the largest satellites of the last decade, such as the 8-ton Envisat, in many key parameters. When SSTL analysed the improvements in resolution of its own optical imaging satellites, it discovered that between 1990 and 2009, the resolution achievable on our satellites almost exactly tracked Moores law. In terms of the key parameter for such missions  the ground sample distance (commonly referred to as the resolution) has dropped from 32 meters at the start of the decade to 2.5 meters for TopSat launched in 2005 and NigeriaSat-2 to be launched next year. Ongoing technology development at SSTL now enables the company to offer Sub-1-metre small satellites to the market for launch in the 2012+ timeframe. 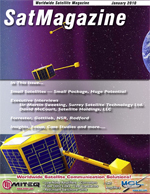 Thus, small satellites have become a classic case of the disruptive technology referred to by Clayton Christensen in his 1990s works Disruptive Technologies: Catching the Wave and The Innovators Dilemma. The technology being disrupted is the large and exquisite imaging satellite with a price tag measured in $ billions rather than $ millions. While such systems produce superb imagery, they are generally unaffordable to all but the richest countries and, even then, are generally too expensive to deploy in multiple numbers limiting the ability of the owners to gather timely imagery. A constellation of small satellites, at, or below, the price of one large and exquisite satellite, could provide much more imagery in total and much more timely imagery with latency measured in hours rather than days. Such a system would also be inherently fault resilient through redundancy at constellation level and would also allow much simpler service continuity by occasional replacement of one satellite in the constellation rather than the big bang approach of replacing a large and expensive satellite with a rebuild every few years. What this implies in terms of launch mass is that operational customers are generally demanding new missions with high capability which translates into masses in the range 100kg to 500kg. For non-operational missions with education or technology demonstration aims the masses are typically sub-50kg. For the operational customers, the market for such satellites would surely expand very rapidly once there is a reliable, low cost and readily available launcher addressing this market. Fingers crossed  SpaceX and Virgin Galactic achieve that goal in the coming years.